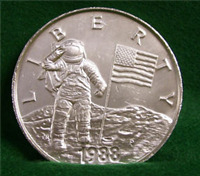 USA 1988 P Young Astronauts Liberty Commemorative Silver Medal, 6 troy ounces version Buyer. Medal is 76 mm in diameter. This medal was sculpted by James Licaretz and designed on the obverse by Essan Ni and on the reverse by Robert Ahlcrona. On the obverse is a standing figure of an astronaut and a US flag planted on the surface of the moon. LIBERTY above and the date, 1988 below. The reverse pictures an eagle on the top of stylized "A" surrounded by legend, UNITED STATES OF AMERICA - YOUNG-ASTRONAUTS. Turner catalogs the America in Space medals as #44, however, he makes no mention of the 76mm medals. 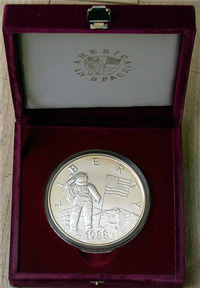 According to the research of William Swoger, the America In Space medals were struck with three different obverse designs combined with a common reverse design. 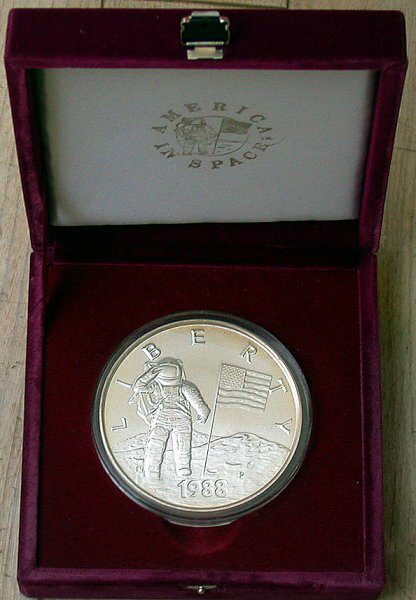 Gold medals, featuring a space shuttle flanked by 13 stars, were stuck in 76 and 23.5mm sizes; Silver medal featuring the astronaut on the moon, were struck in 76 and 38mm sizes. The 76mm medal was struck with a matte finish and came in two thickness; the smaller with a mintage of 1075 weighs 6 oz., while the larger weighs in at a massive 12 oz. and has a mintage of 3700. 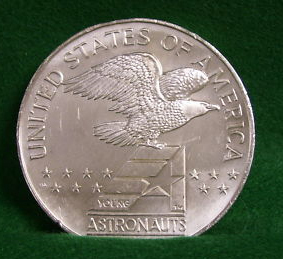 The bronze medal, featuring the space shuttle against a partial US flag, was struck only in a 38mm size in both matte and proof finishes.